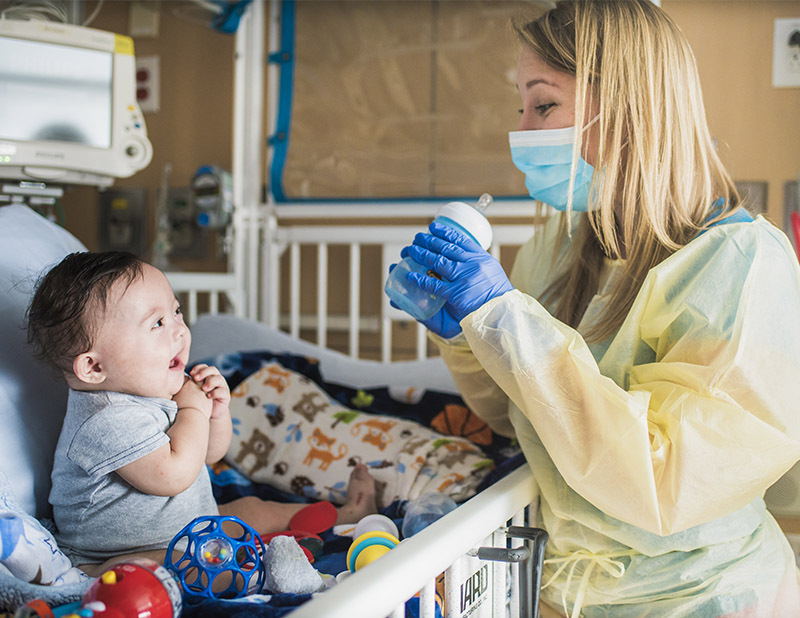 Meet the USC Chan occupational therapists working side by side with doctors, nurses and surgeons to make a difference in the lives of sick children. When Kimberly Grenawitzke ’07, MA ’09, OTD ’14 pulls out of her driveway at 6:15 a.m., headed from her Manhattan Beach, Calif., home to her job at Children’s Hospital Los Angeles (CHLA), she knows one thing for certain: It’s going to be an interesting day. Clad as usual in scrub pants, T-shirt, silly socks and sensible clogs, she might help a young teen with a traumatic brain injury relearn everyday activities like hand washing or writing one’s name. Or find a way for a preemie with a feeding disorder to finally suckle from a breast or bottle. Or teach hand exercises to a 17-year-old girl with a transplanted heart and a yearning to do the things that her peers do effortlessly, like hold a mascara wand steady so she doesn’t smudge her face. Grenawitzke is among an elite corps of doctors of occupational therapy at CHLA, the sprawling complex with 356 active beds that straddles Sunset Boulevard. Dating to 1901, this oldest and largest pediatric hospital in Southern California is an academic fieldwork site for the USC Chan Division of Occupational Science and Occupational Therapy. On top of her regular OTD duties on the acute, inpatient side, Grenawitzke heads the hospital’s OTD residency program and is the primary clinical mentor for residents. A specialist in feeding and swallowing, she is among a select group of CHLA OTs who are able to assess modified barium swallow studies, a procedure that determines whether food or liquid is entering a person’s lungs, and is a certified practitioner of VitalStim, an electrical stimulation for the management of dysphagia, or difficulty swallowing. And that’s not all. Grenawitzke is an accomplished splint maker for patients with hand-related needs. Some of her trickier splint cases involve babies who, due to a chromosomal defect called trisomy 18, have clenched fists with overlapping fingers that are hard to straighten. OTs who are climbing the ladder at CHLA speak of Grenawitzke with awe. “She’s a remarkable combination of being fantastic as a clinician while also being one of the best teachers I have come across in any area of my life,” says Rani Waterman MA ’16, OTD ’17, an OT resident whom Grenawitzke mentors at CHLA. When it comes to Trojans, Grenawitzke has plenty of company at CHLA. 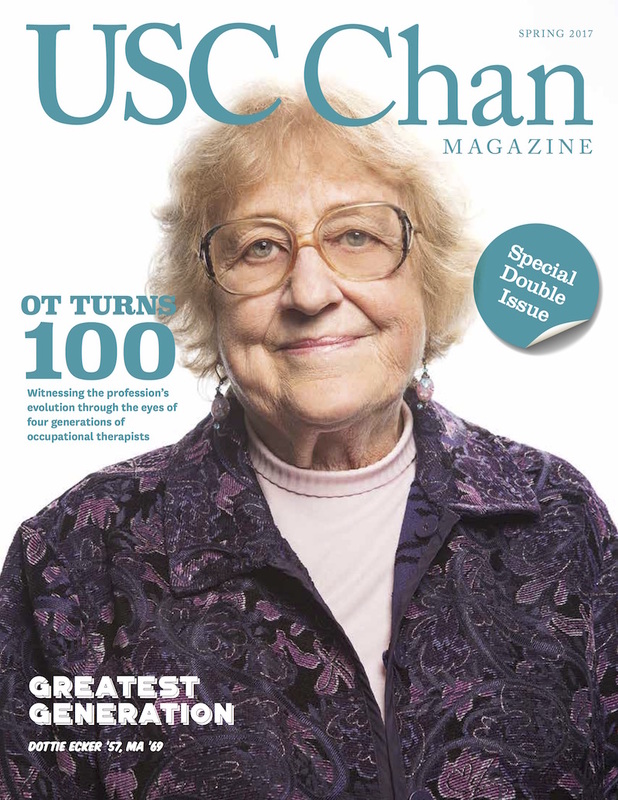 To fill OT positions and especially OT leadership ranks, CHLA draws heavily from USC Chan, whose OT program is the oldest in California and the largest as measured by research dollars. Of the hospital’s current OT staff of 43, more came out of USC than any other single college or university, says Bryant Edwards MA ’05, OTD ’06, manager of the occupational therapy program at CHLA. Moreover, each of the hospital’s six doctors of occupational therapy are products of the division, as are two OTs who are currently pursuing clinical doctorates (advanced standing doctorates for individuals who already have master’s degrees) and one PhD. Anyone who’s gone through the clinical doctorate process will attest that it is no walk in the park. USC Chan’s year-long advanced standing OTD program involves at least 20 hours a week of on-site clinical work and up to eight units per semester of theory-heavy coursework, plus at least four credits of electives taken outside the division. After spending a number of years focusing on their full-time jobs at CHLA, Grenawitzke and her colleague Judy Hopkins ’95, OTD ’15 both returned to USC Chan for clinical doctorates. Neither have regrets. “A lot of times an OT will ask me, ‘Is it worth it, when you’re already making a good income?’ And I say, ‘Absolutely.’ The connections with world-class faculty are amazing,” says Hopkins, who recently joined the USC Chan teaching staff as an adjunct assistant professor of clinical OT. Like Grenawitzke, Hopkins is passionate about feeding and swallowing, the single most common type of ailment among CHLA patients. To help this large population, Hopkins developed two outpatient groups — the Lunch Bunch and the Supper Club — for youngsters who use feeding tubes due to intestinal conditions such as short bowel syndrome. Some are so averse to food that they gag at the sight of it, Hopkins says. Once a month, in the occupational therapy kitchen, OTs get together with the Lunch Bunch and the Supper Club kids, encouraging them to look at food, touch it and play with it. The hope is that one day, the children will be able to ditch the feeding tubes and eat on their own. That’s the guiding principle that she uses today. When she’s successful, especially after 10 hours on the job and a bumper-to-bumper drive home, it makes her day. No two days are exactly the same for Grenawitzke, a pediatric occupational therapist at Children’s Hospital Los Angeles (CHLA). A skilled practitioner, Grenawitzke must remain focused yet flexible enough to shift gears from working with patients to collaborating with doctors to mentoring OTD residents. Put on your scrubs because we’re following a day in the life of Dr. Grenawitzke. 7:00 A.M. Arrive at CHLA. 7:10 A.M. Drink coffee, review patient charts in the electronic medical record system with OT team in the therapy gym. 7:30 A.M. Huddle with acute OT team to distribute new evaluation orders and assign patients who need coverage. 7:45 A.M. Huddle with speech language pathology team to distribute dysphagia orders and discuss coverage of NICU patients. 8:00 A.M. Call physical therapy to arrange co-treatments for patients. 8:15 A.M. Speak with radiology scheduler to get two inpatient modified barium swallow studies on the schedule for the day. Inform nurses of the study times, making sure aide staff are aware of time and checking their availability. 8:30 A.M. Call nurses to schedule treatments for the morning. 9:00 A.M. Work with baby who had cardiac surgery to improve bottle- feeding skills. Educate family on oral motor exercises they can perform throughout the day. 9:45 A.M. Speak with cardio-thoracic nurse practitioner about baby’s progress and improvement in bottle feeding. 10:00 A.M. Work with a toddler who is undergoing chemotherapy and has hand weakness. 10:30 A.M. Direct two modified barium swallow studies in radiology. Follow-up with families and medical team about results. 12:00 P.M. Work with baby who was admitted with failure to thrive because of severe reflux. 1:30 P.M. Check electronic medical record for new evaluation orders and organize afternoon treatments. 2:00 P.M. Mentor OTD resident while she completes evaluation of trauma patient in the ICU who sustained many orthopedic injuries and a severe brain injury. 3:00 P.M. Debrief resident regarding successes and areas of improvement for complex patient evaluation. 3:30 P.M. Work with patient with a seizure disorder on motor planning and functional cognition. 4:15 P.M. Discuss patient progress with doctors and rehab coordination manager (for those getting ready to transfer to rehab). 4:30 P.M. Complete patient charting, update OT scheduler spreadsheet.